IU physicists Mike Snow and H. Yan conducted there experiment at the National Institute of Standards and Technology Center for Neutron Research, which ranks among the best research centers of its type in the world. Delivered via beamlines to 29 major analytical instruments—some without parallel in the U.S.—its neutron probes support the research of more than 2,000 scientists and students each year. (Phys.org) —Besides understanding how much dark matter and dark energy there is—about 95 percent of the universe—scientists also want to know more about what dark matter and dark energy are not, as opposed to what they are. Indiana University's Mike Snow, a nuclear physicist who specializes in precision measurements using low energy neutrons, now has another "what they are not" to add to the list. In new research published last week in Physical Review Letters, the professor in the IU Bloomington College of Arts and Sciences' Department of Physics reports that the most sensitive test ever—a new upper bound—conducted to identify a new force acting on neutrons as evidenced by a corkscrew motion of the neutron spin axis uncovered no such result. The piece of research also garnered Snow the journal's "Editor's Suggestion" selection, intended to highlight scientific papers which employ ideas from different subfields of physics. "Despite improving on the sensitivity of previous searches by more than seven orders of magnitude, we saw nothing," Snow said. "That's OK though. Even seeing nothing still helps in eliminating possibilities for new forces. " Snow and co-author H. Yan, a postdoctoral researcher at IU working with Snow at the Center for the Exploration of Energy and Matter, analyzed data from this IU-led experiment which sent intense beams of low energy, spinning neutrons through one meter of liquid helium to search for any interaction between the neutron and the helium atoms which could cause a twist of the spin axis. Of the four known forces of nature, three of them—gravity, electromagnetism and the strong interaction—cannot twist the spin, and the fourth—the weak interaction—was known to give a small effect in the regime where Snow and Yan were searching. 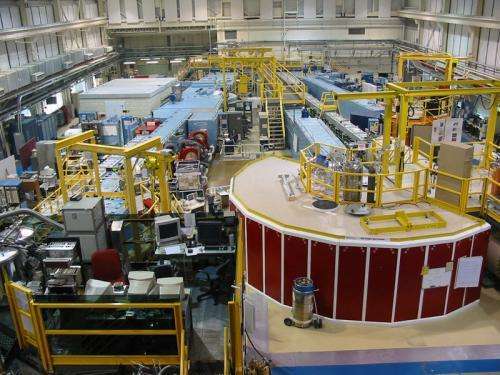 Snow said more sensitive searches beyond the new upper bound reported in the paper could be performed using neutron spin rotation measurements in heavy nuclei or through analysis of other experiments conducted using delicate measurements with spinning neutrons. Slow neutron spin rotation is a very sensitive technique used to search for possible exotic long-range neutron interactions which violate parity, or the assumption that nature behaves identically when left and right are reversed. In parity, like interactions whose spatial configurations are switched, as if seen in a mirror, ought to be indistinguishable, but weak interactions allow for parity violations. The experiment was conducted using the NG-6 beam line in the National Institute of Standards and Technology's Center for Neutron Research in Gaithersburg, Md. Funding for the research that produced the new paper, "New Limit on Possible Long-Range Parity-Odd Interactions of the Neutron from Neutron-Spin Rotation in Liquid 4He," came from the U.S. Department of Energy and the National Science Foundation. Somebody with the funds model the DM/DE problem as an unknown, massive particle with no charge. It should be modeled as attracting and being attracted to ordinary matter, but repelling itself. Effectively, it produces "gravity" when interacting with ordinary matter, but produces "anti-gravity" when interacting with other particles of its own kind. I was thinking it should probably be something like a Neutron or a Neutrino, except for the exotic "psuedo-gravitational" properties. When I was sitten on the toilet box dis mornin I thougths dat particularoids that makes anti-gravitations is kinda like the ones that makes me poop fast, on account of the gravity bee in reversed to whats makes me get cheesed up, so anti-gravity is like beans and gravity mostly like cheese. Now I don't know the quantum number for cheese, but lettuce say it's 4, and on account of it being like gravity that makes the quantum number for beans to beez -4, so if you eats equal amounts you should be good to go. And that goes to show what my paw done said is right causen if he was wrong then something or other about a whoopen upside yer head, and then no quantum of flushen is gonna clear the bowl. …. Of the four known forces of nature, three of them—gravity, electromagnetism and the strong interaction—cannot twist the spin, and the fourth—the weak interaction—was known to give a small effect in the regime where Snow and Yan were searching. It is interesting to note that even nowadays we have the theories which could make some prediction with all the four forces, but we still could not understand they work! Knowing their physical mechanism (as below) may help to solve the problem. On par with mine. :-) Were they testing for a hypothetical 'extra' force, beyond the standard model? In my hypothesis because ordinary matter would be attracted to these particles and vice versa, there would be certain accumulations of the DM stuff in everything, even the matter we think is entirely ordinary might actually be several percent "Dark". If you imagine a cloud of the stuff, it would all want to push away from itself (attempt to explain Dark Energy,) but because it's all pulling on the ordinary matter, and the ordinary matter pulls back, some of the DM would clump up with ordinary matter in galaxies. If you want to try to understand the mechanics of a stable system involving such particles, you might start with a 3-body that uses 2 of such theoretical particles and one ordinary matter particle. in this case, the stable configuration is for the one ordinary matter particle to be in the center, and the two dark particles will each be on opposite sides, as they repel one another, but they are attracted to the ordinary matter particle. Thus a hypothetical ordinary matter particle outside that 3-body system would "feel" the "mass" of 3 particles, even though only one of them is ordinary matter. larger systems are hard to model in your head or on a piece of paper, but it can be done with a bit of a sketch for an aid, and then you can imagine small "galaxy" models and how they interact. I believe the DM particles, in such a model, should tend to "pile up" a bit in the inter-galactic space, as the concentrations of the same material inside the galaxy pushes these outward to equilibrium. So in this model, the DM can't undergo a total gravitational collapse, because it's self-repelling, and indeed, the self-repelling aspect actually helps stabilize the galactic halo and the spiral bands, or at least I think it would work. The size of the attractions and repulsion need not be symmetric, which is another variable that is very hard to model in your head or on paper, but could be fine tuned in a computer model to try to achieve the best results. Remember, asymmetry exists even with ordinary matter. Modeling this properly on a galactic scale would require immense computing power probably beyond existing super computers. See the article on seeing complex systems.